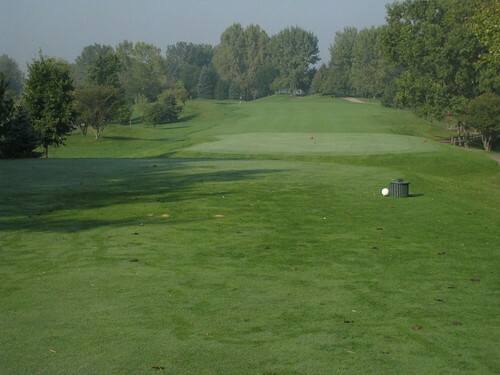 Some friends told me that Prairie isle Golf Club in Crystal Lake, IL was an out-of-the-way track that was a pretty good play, so I decided to give it a shot. Roughly 35-40 minutes from my house isn’t too far, so what the heck, right? The course starts with a relatively straight par 5, measuring 511 from the tips. 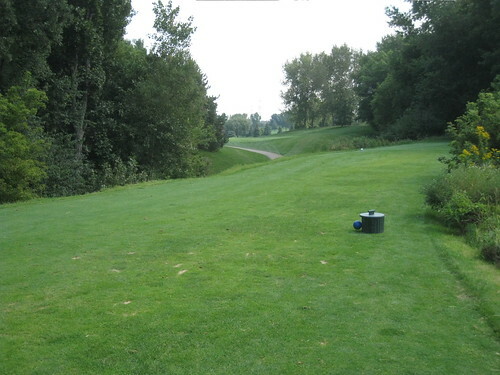 The tee shot is a bit blind, with the preferred angle hugging the left side of the fairway. You may hit the downslope, and be able to go for it in two, but there’s trouble on both sides of the fairway so be forewarned. The right side is actually the 18th fairway, but it’s OB off the first hole, and there’s water up the right. I layed up, giving myself about 100 in and two-putted for an opening par. 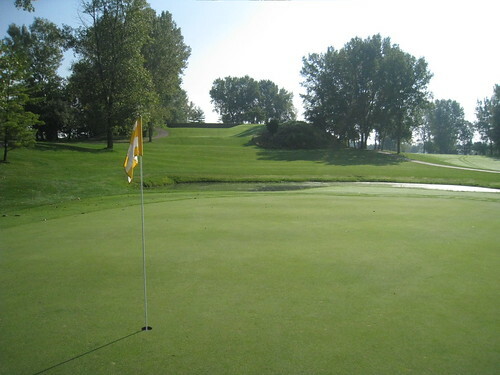 The second is a downhill 344-yard par 4. 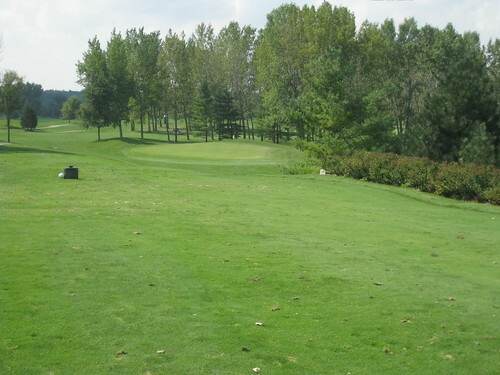 The difficulty here is threading the needle of trees on both sides of the fairway with your tee shot. If your driver is hot this might be reachable, with a good kick off the downslope and a dry fairway. If not, it will easily be 100 yards or less for your approach. I opted to hit a hybrid off the tee (which brings the bunker on the right into play), and was left with about 120. Wedge and two putt for a par; so far so good. 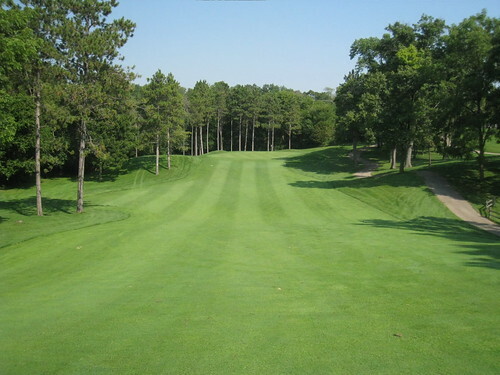 The third is another relatively short par 4 (350), with a pretty fat fairway. That being said, there’s water right (although not visible from the tee) so be aware. The best approach is from the center or center-right of the fairway, so don’t just bail left because of the trouble or you’ll have to carry a bunker (and maybe a tree or two) with your second shot. The shorter the wedge, the happier you’ll be with this precise approach. Pretty, isn’t it? Be on the lookout for turtles! So far this course has been relatively short, even from the Blues. Well that’s about to change, with three holes in a row that will test your longer clubs. A 190 yard par 3, followed by a 444 yard par 4, and finishing with a 564 yard par 5. You better be warmed up by now! The fifth is the longest par 3 on the course, measuring 190 from the Blues. It’s also a bit uphill, and possibly into the prevailing wind so club up! I hit a 5-iron much better than expected and still ended up a bit short, as you can see below. The strength of the 6th and 7th are their length. Par on either of these holes is almost going to require an exceptional tee shot. Focus! The 8th is a beautiful hole. 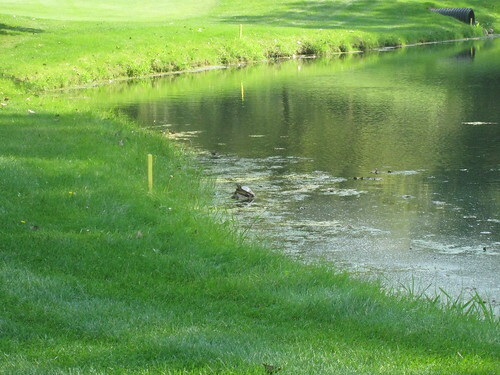 It’s a downhill, 154 yard par 3, with the green surrounded by trouble (mostly water.) I hit a Pitching Wedge and was very happy with the shot. 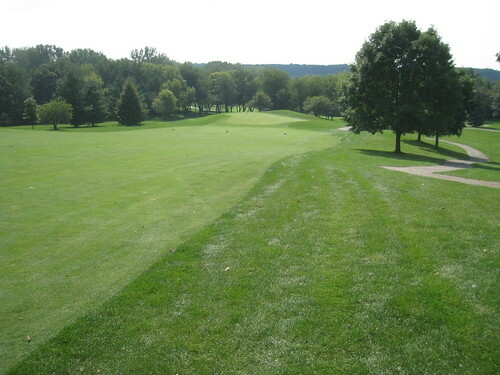 Here’s a view looking back to the green; note the elevation change. 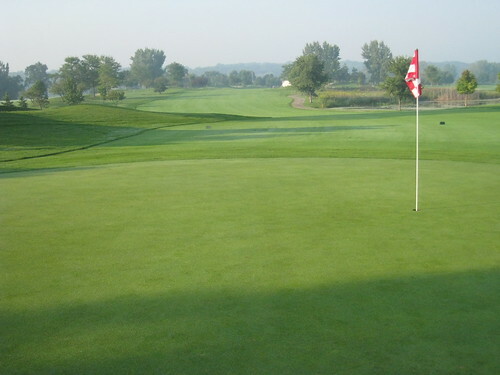 The ninth is as straight as a par 4 can be. It measures 444 yards, and the tee shot is uphill. 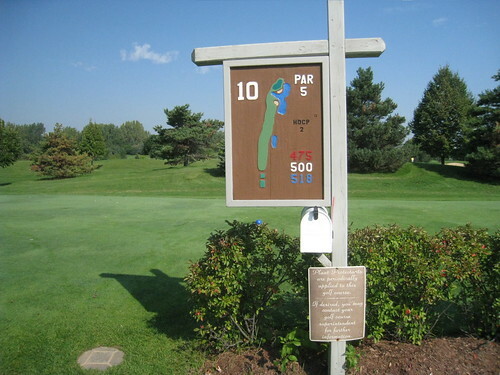 Hitting the fairway is key, considering your approach may be anywhere between 180-200+. This is a very strong par 4, with a big greenside bunker on the right. 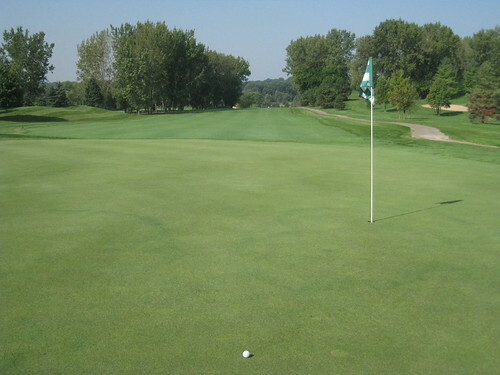 Regardless of pin position, aim up the left side and depend on your putting skills to get par. I bogeyed and was very happy with the result. 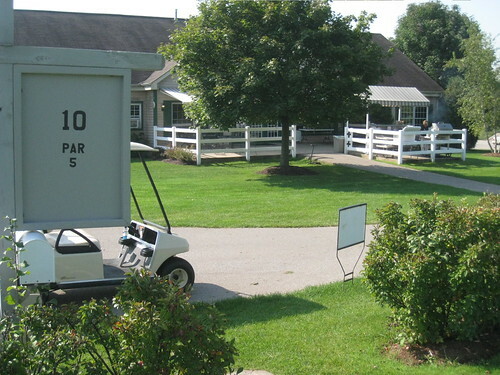 Standing on the tenth tee, you’re directly adjacent to the clubhouse if a snack or a break is needed. The day I played, there was someone cooking on the grill outside the clubhouse. It smelled really good; great advertising! 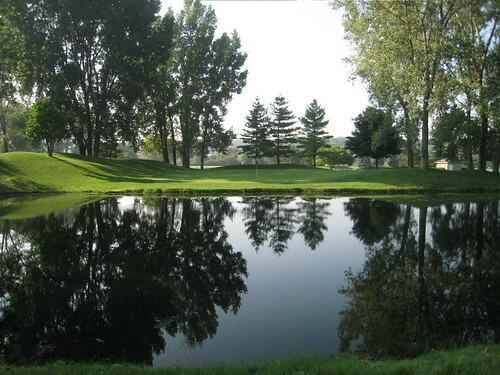 Water up the right and in front of the green. What it doesn’t show is that the left is all OB. Play it safe here; you can thank me in the comments. Eleven is just another beautiful hole. Standing on the tee of this par 4, you can see a lot of the back end of the course, including most of the water. No homes are visible, the wind is light because of the hills in front of you; really a great spot. It’s also a challenging hole. 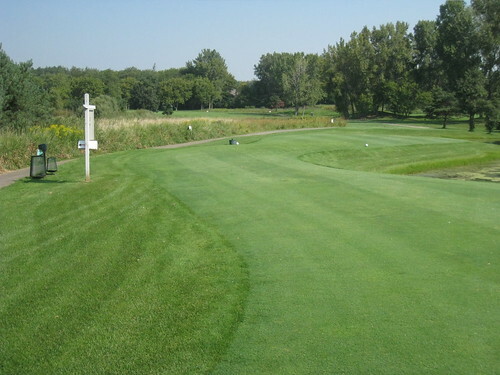 It’s a sharp (as in 90 degree) dogleg left, so be aware on your tee shot. Driver may be too much. Visually, it’s just plain challenging the way they laid it out. The preferred landing area is just left of the tall tree in the middle of this picture. The approach is uphill, with the green not visible from where you’re standing. I was also left with a downhill lie. Am I a sadist for loving this hole? The tee shot on twelve is simple enough, looks like lots of room to land it. 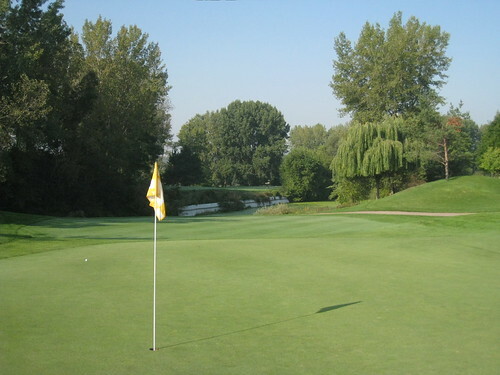 Depending on how far you hit it is going to dictate the difficulty of parring this hole. 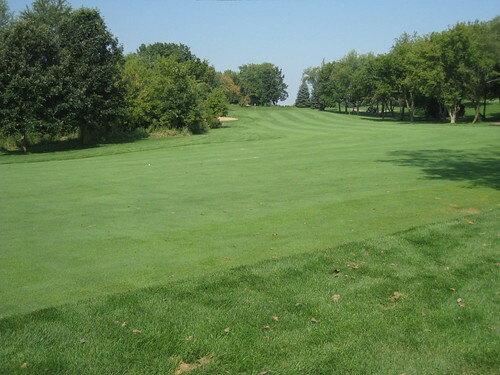 About halfway through this 374 yard par 4, the fairway drops significantly to a green that is well below the tee. You may have an uphill or downhill lie, but probably not flat, unless the tee shot is perfect (tough to do, especially the first time you play.) Here’s what my approach looked like. 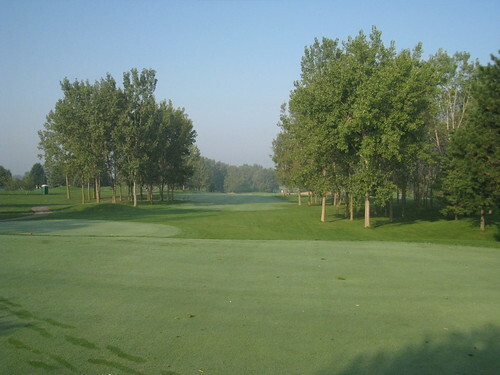 A quick note; the twelfth tee was the first place on the course where you start to see houses. You’ll see them for most of the rest of the course, but they don’t get in the way in any way, shape or form. 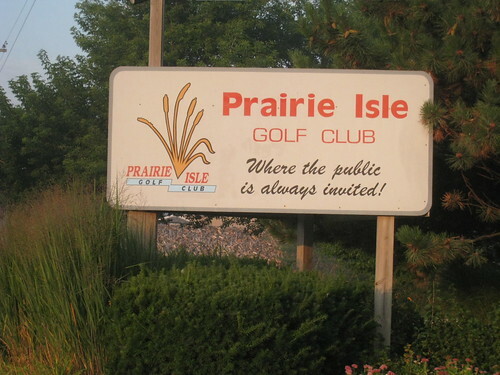 Some folks frown on the uptick in residential golf course real estate, but at Prairie Isle Golf Club it’s done at a minimum, and it doesn’t detract from the round at all. Thirteen is almost a mirror of 12, except that the tee shot is uphill instead of flat. The approach is also severely downhill on this hole. I hit a boomer of a tee shot, and ended up rolling into the right rough, leaving me this for an approach. Here’s a view form the back of 14 green looking towards the tee. Lots of room to bail left off the tee. Fifteen is an all-carry par 3, measuring in at 162 yards. There’s a little room to bail right but not much; be careful here. Long is also better than short. 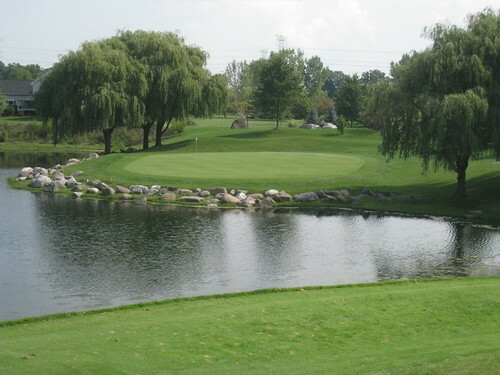 The course finishes on a relatively short par 5 (505 yards.) 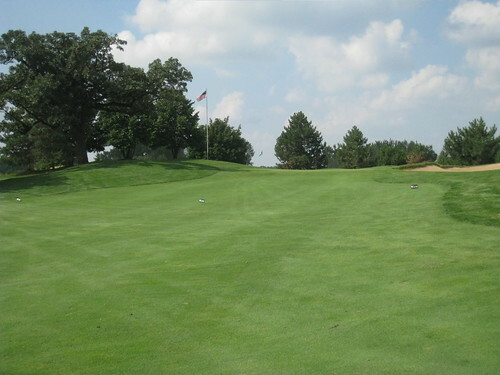 A well-struck tee shot will kick left, as the slope of the fairway goes that direction. It’s possible to go for it in two, but the second shot is going to be uphill, over a few trees and blind. I laid up, leaving myself with an uphill third. My round went by much quicker than expected (considering I was playing as a single.) I did notice that even though this course is open to the public, most folks here know each other, and there’s a lot of camaraderie. That’s good and bad. Good because it builds a strong base for this great track, and bad because I felt ignored both times I entered the clubhouse (pre and post round.) Not the end of the world, but noticeable. Other than that very small negative, the course itself impressed. It’s very playable for the longer player, and I saw a LOT of women playing, which I view as a good thing. I’d be happy to bring my wife here to play; I think she’d enjoy the scenery, and the length from the Red tees is perfect for her game. 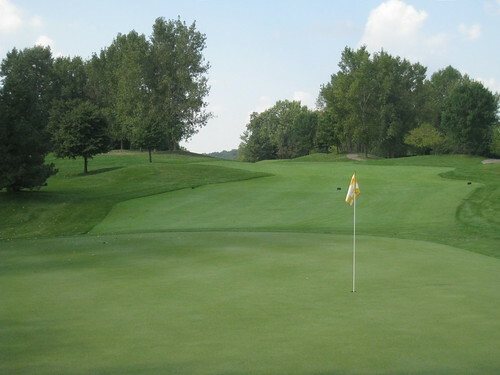 Yes, it is out of the way and yes, I felt a bit snubbed in the clubhouse but the golf course itself was in great shape, and I was impressed with the design. 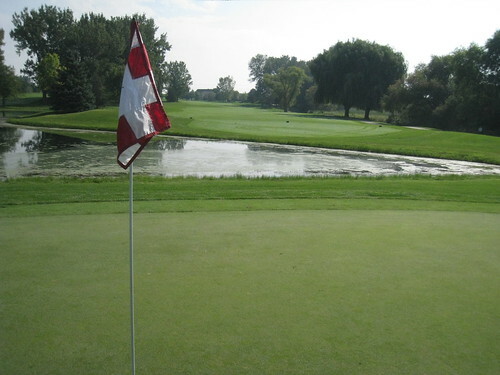 When I add in the lower than expected greens fee, I’d definitely give Prairie Isle Golf Club a thumbs up, and suggest it to anyone that wants a peaceful yet challenging round of golf. Next post: Have a Kindle? Enjoy this often-lame blog there!